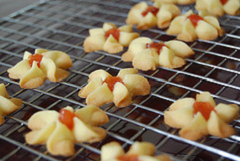 Jam drops cookies. Delicious and old-fashioned biscuit. Easy recipe. Cream margarine till soft and light. Add sugar a little at a time and beat well. Add essence. Fold in flour gradually and mix to a smooth dough. Put dough in a pipping bag fitted with a nozzle. Pipe out rosettes onto lightly greased baking trays. Decorate tops with a little jam. Bake in a preheated oven at 450°F till golden. See Customer Reviews and Compare Bakeware sets .